I always wondered about the "Lifetime Master" discussion in section 19.21 of the NRA rulebook. For you guys that have been involved in Bullseye longer: What was the rationale for a Lifetime Master card? Did you have to do anything special to get one or were all Master cards for life back then? Any idea when NRA got rid of it? The NRA sent you a letter after you made Master and you could make the choice if you wanted to be a Lifetime Master or not. 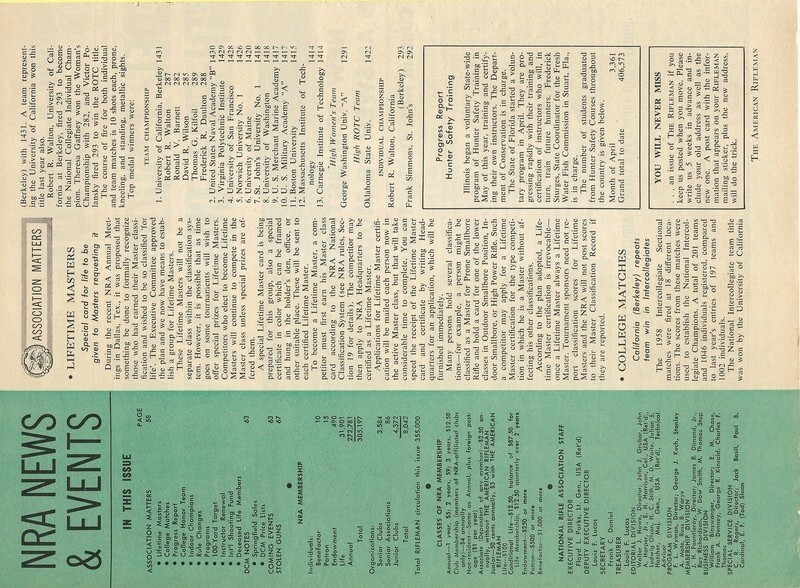 There were a lot more shooters back then and I think it helped the NRA (pre-computer era) keep track of classification. There was no class higher then Master but a shooter could always drop back down a class if his skill set failed. Once you were a lifer they didn't have to track you anymore. The down size was you stayed a Master even if your skills went away. The upside was you stayed a Master even if your skills went away. I don't know when they stopped the program. Probably when they invented High Master. 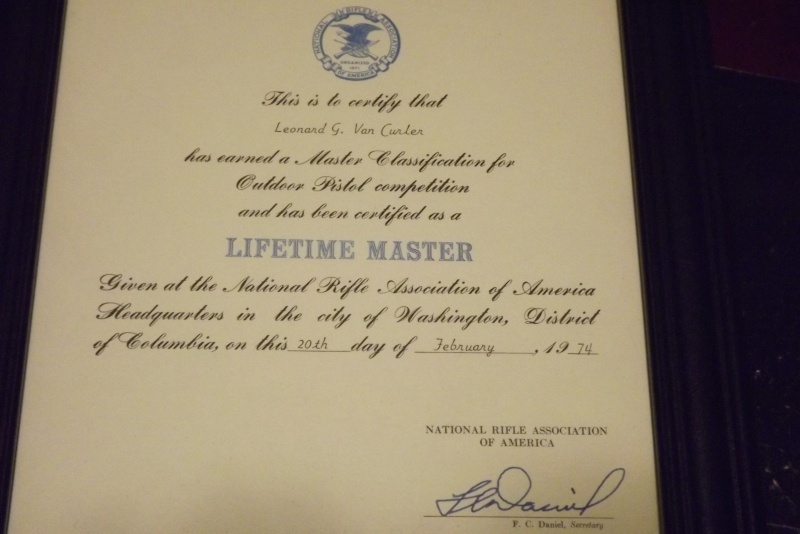 Hmmm I wonder if I would stay a Life Master if I started shooting High Master scores.. The only thing I'll add is that when I first started shooting "conventional pistol", the cut-off for master classification was 90%, instead of the current 95%. I don't know when that was Mike. You had to shoot 2565 in 1972 to make Master just like today. But there were no High Masters just 2600 shooters. I say "just" 2600 but I mean their cards also said Master. It also wasn't called Conventional Pistol. I have no idea when that showed up. I had my Master card for 2 years before they sent me a letter offering a Lifetime Master card so it wasn't offered instantly or maybe that is when that program started. Very nice "old thing hanging on wall"
BE Mike wrote: The only thing I'll add is that when I first started shooting "conventional pistol", the cut-off for master classification was 90%, instead of the current 95%. OldMaster64 wrote: I don't know when that was Mike. You had to shoot 2565 in 1972 to make Master just like today. But there were no High Masters just 2600 shooters. I say "just" 2600 but I mean their cards also said Master. It also wasn't called Conventional Pistol. I have no idea when that showed up. I had my Master card for 2 years before they sent me a letter offering a Lifetime Master card so it wasn't offered instantly or maybe that is when that program started. I recall seeing the line "2600 shooters must declare" on match programs in my early years. The "Rifleman" carried a schedule in all issues and it seems there were just "Pistol Matches" then? I started in 1971 and it changed shortly after I started. Master could have been 91% instead of 90%, as someone suggested. The old classification cards just said "Outdoor Pistol" (I just looked at my Master card issued in 1998). I think that they started saying "Conventional Pistol" around 2000. I know about 1985, the scoring rings were changed for Air Pistol. The NRA issued me three cards in three years, first lowering my classification and then raising it after I had posted more scores at the higher level with the smaller 10 ring. Congratulations on your Lifetime Master achievement. When I started competing in '78 I remember the old early master classification shooters. I also remember shootering in the "2600" class while I was still holding an Expert classification. At the big matches the 2600 class would be the largest class on the board. I'd win a few award points across the board but not like I did when was shooting through the classes. UC Berkeley the Intercollegiate Sectional Rifle Champions. Yeah, California didn’t go looney tunes until the late 60’s. Wobbley wrote: Yeah, California didn’t go looney tunes until the late 60’s. True....but the State kept them under control until 1990's.